A high school biology teacher, changed and inspired by God’s love, developed a strategy to help his students discover hope while teaching the required curriculum. Stories are powerful things. They stir our hearts and imaginations, inspiring us to pursue our dreams and accomplish great achievements. Powerful stories have always played an important role in my own personal story. I grew up as a Mormon, but had turned away from religion for multiple reasons as a young adult. At some point during college I had adopted a deistic view of God, but still believed God was irrelevant to the study of the world around me. Even though I believed God existed, never would I have thought to bring biblical ideas into my study — that was scientific heresy. Initially I had pursued a career as a lab scientist. However, I later changed direction and earned a teaching degree. Graduating with credentials in biology and chemistry, I landed a teaching job shortly after graduation. I married a lovely Christian girl, but I was simply pretending to be one (but that’s a story for another time). For years, I taught my biology class and worked to develop state standards that promoted the Darwinian evolutionary view as fact. My wife would pester me about teaching ideas she didn’t believe as a Christian, but I arrogantly thought she was stuck in superstition while I was pursuing the unbiased truth. Logic and scientific thinking have fascinated me for as long as I can remember. I was told I would find truth by following the path of great scientists like Gregor Mendel and Charles Darwin. I believed I could make the world a better place by contributing to the advancement of scientific understanding. I bought into the ideal that I could be an independent determiner of truth through the scientific method and my own human reasoning. However, I didn’t realize the story that inspired me was actually not a true story. Then, I experienced a change of heart — that is, God changed my heart. Upon receiving Jesus as my Savior, it felt as though He flipped a switch in my mind. As I read the Bible, I recognized the true account of how the universe, all of the living things, and myself had come to be. I turned from the tall-tales of Darwin and his disciples to the true story of Jesus as Creator and Savior. My foundation changed from naturalism to supernaturalism, and so did my view of origins. What was I to do? I loved teaching, but my biology curriculum presented Darwinian evolution as fact and remained a part of the information the students were expected to know for their tests. Thankfully, I developed a strategy that served me well, and I hope it can do the same for you. I taught the nature and foundation of science as one of the first units to my sophomore biology class. 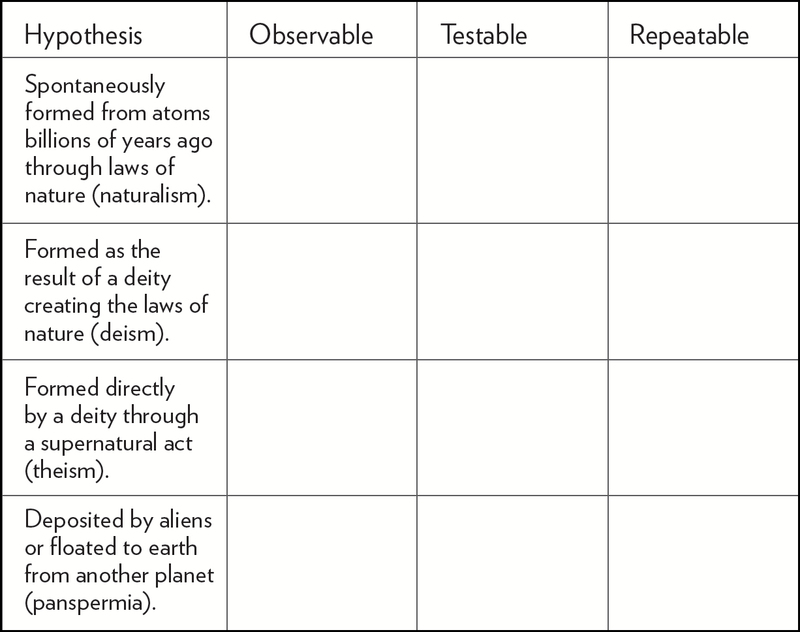 The textbook laid out the three basic hallmarks of the scientific method — observability, testability, and repeatability. It described how scientists used the scientific method to understand the world around them. Rather than accepting superstitions, they carefully observed the phenomena, formulated experiments to test their ideas, and had them repeated and con-firmed by others. Having laid the foundation of what and how science can help us know, the textbook actually unwittingly undermined its own proposed story of origins. As we moved into the origin of life chapter, I gave the students an inquiry task. After each group of students received the following table, I tasked them with placing an X in each box that fit the hypothesis of how life first appeared on earth. After the allotted time, we discussed why their tables were blank (or should be blank). Since biological evolution, including the origin of life, is a story about the past that can’t be observed, tested, or repeated, the students realized that the claims being made were not “scientific” in the sense of being subjected to the scientific method. This allowed them to distinguish between historical science and operational science. This activity also could be implemented with cosmological evolution in an astronomy class, geological evolution in a geology class, and human and cultural evolution in various social science classes. The students saw for themselves that we all examine the same evidence in the present and try to interpret how it came to be in the past. We discussed how our starting points (presuppositions) strongly influence the interpretation of the same evidence — especially when it comes to origins. As a class, we concluded that while we can examine organisms, DNA, rock layers, fossils, nebulae, and exoplanets, we still must base explanations of how they came to be on a measure of faith. Some put their faith in natural processes acting randomly over billions of years, others put their faith in aliens, and still others see the Triune God of the Bible as the source of all being and life in the universe. I understand the world around me in light of God as the Creator. So, as I taught, I decided to point students to wonder and awe at the intricate complexities all around us, taking advantage of appropriate opportunities to affirm my belief in God as Creator, His purpose for my life, and the hope of eternal life. Random processes and aliens leave humanity without much hope. As Christian educators approach these topics, they should be aware of the climate in their schools. Different environments will require different approaches. I taught in a small town where after school activities ended by 5 o’clock so the students could attend Wednesday night church services. I also served as the Fellowship of Christian Athletes director for our school, so the students were aware of my views. In essence, Christian educators should seek to be as wise as serpents and as innocent as doves as they share the truth about origins with students while fulfilling their teaching duties. When Christian educators pray, seek wise counsel, and study God’s Word, their students can see the light and love of Christ in them. Then educators can embrace God-ordained opportunities to effectively answer questions from their biblical worldview, sharing their stories of hope. a systematic approach to understanding that uses observable, testable, repeatable, and falsifiable experimentation to understand how nature commonly behaves. I enjoyed this article in the CEAI Teachers of Vision Magazine, but I had already forgotten about it in this age of being bombarded by so much written word everywhere. It was great to read it again today and be reminded of a perfect strategy to help students see the truth. Thanks for sharing this with us again. Outstanding article with great scriptural wisdom concerning the application within our own school climate. Well done. Roger, making the nature of science and the differences in historical and operational sciences a part of how origins can be taught in public schools are excellent methods. I enjoyed your Inspiring testimony. Looking forward to reading your books. That is wonderful and I love how you included to worksheet so others can use your ideas!